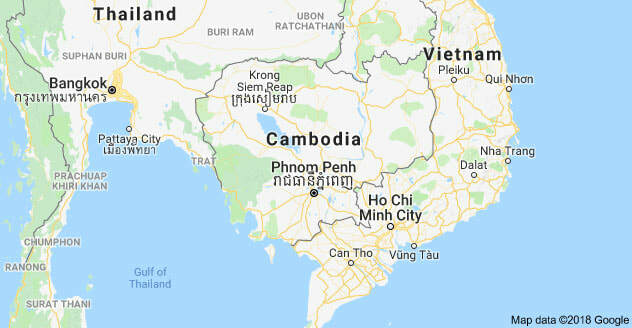 ​Cambodia is a Southeast Asian nation whose landscape spans low-lying plains, the Mekong Delta, mountains and Gulf of Thailand coastline. Phnom Penh, its capital, is home to the art deco Central Market, glittering Royal Palace and the National Museum's historical and archaeological exhibits. In the country's northwest are the ruins of Angkor Wat, a massive stone temple complex built during the Khmer Empire. Angkor Archaeological Park. the ancient city of Angkor and popular tourist site, was declared a UNESCO World Heritage site in 1999. 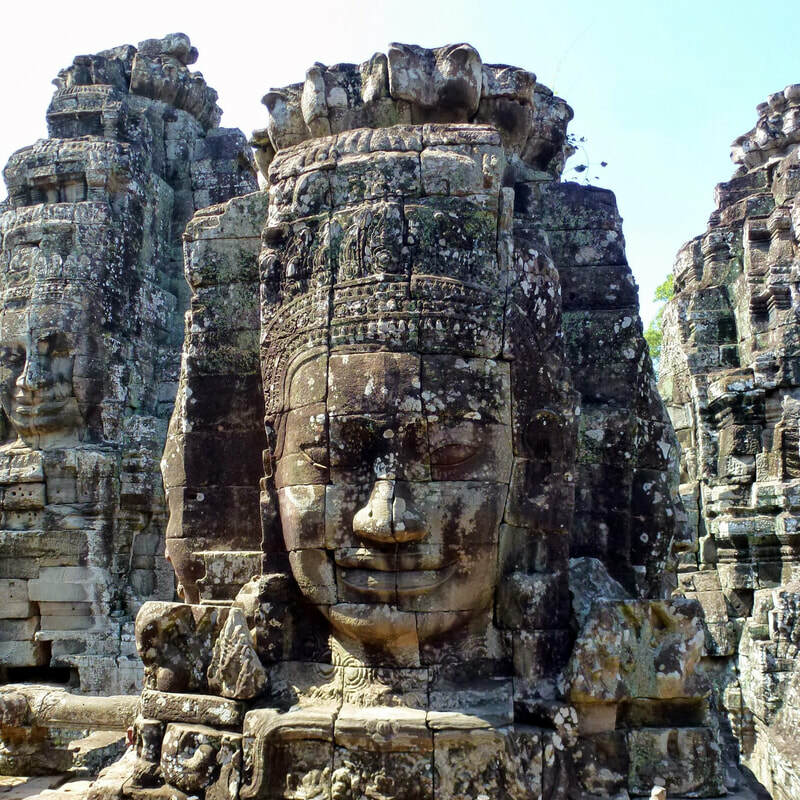 The word Angkor translates to "City of the King," and the park is home to world-famous Angkor Wat, the many stone faces of Bayon Temple and Angkor Thom, among the many other former capitals of the Khmer Empire, dating as far back as the ninth century. Siem Reap is the town where travelers stay when visiting Angkor, just 5 miles away and and it is rapidly building a tourism infrastructure to cater to the demands of Western travelers. 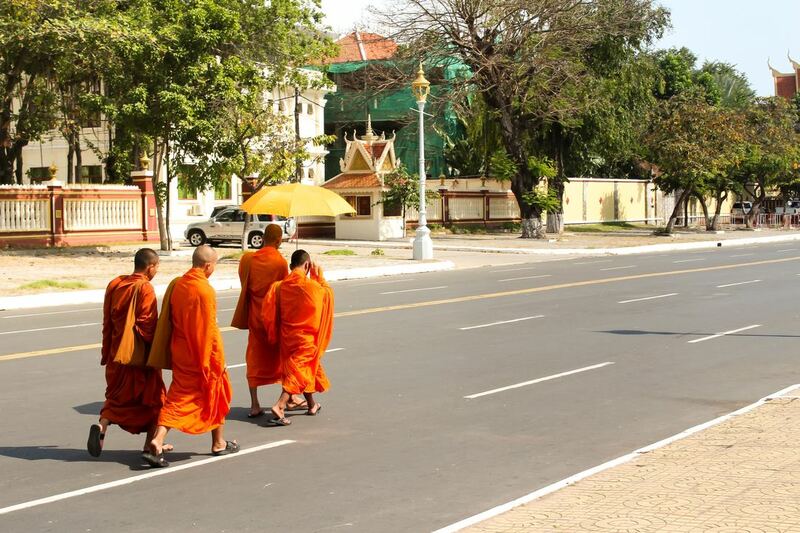 Phnom Penh is a city revitalized, and the intriguing capital has enough of interest to hold visitors for several days. 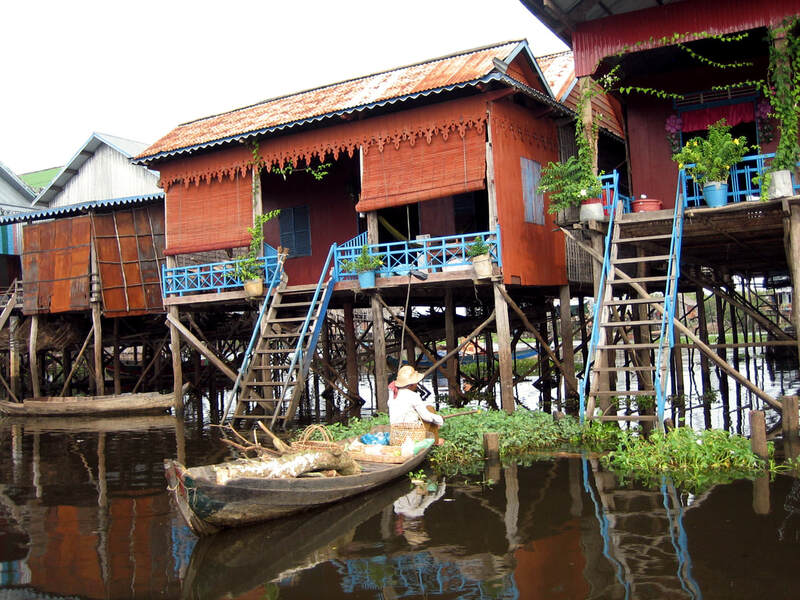 It is also an important business destination, and is becoming a popular port of call for Mekong River cruises. Sihanoukville, four hours south of Phnom Penh, offers decent beaches and a sleepy atmosphere. For the more adventurous, there are the remote and hilly provinces of Mondulkiri and Ratanakiri, close to the borders with Laos and Vietnam. ​All of the spectacular, carved-stone buildings in the Angkor complex were built AD 800-1400, the height of the Khmer empire. The city was attacked and abandoned in the 1400s. It was unknown to Europeans until French archaeologist Henri Mouhot came across the ruins in the mid-1800s. (There's some debate about whether Mouhot was really the first Westerner to see the site, but his account of finding Angkor drew the most attention.) Archaeologists worked for more than 100 years to restore and protect Angkor (as well as to carry home some of their favorite pieces). 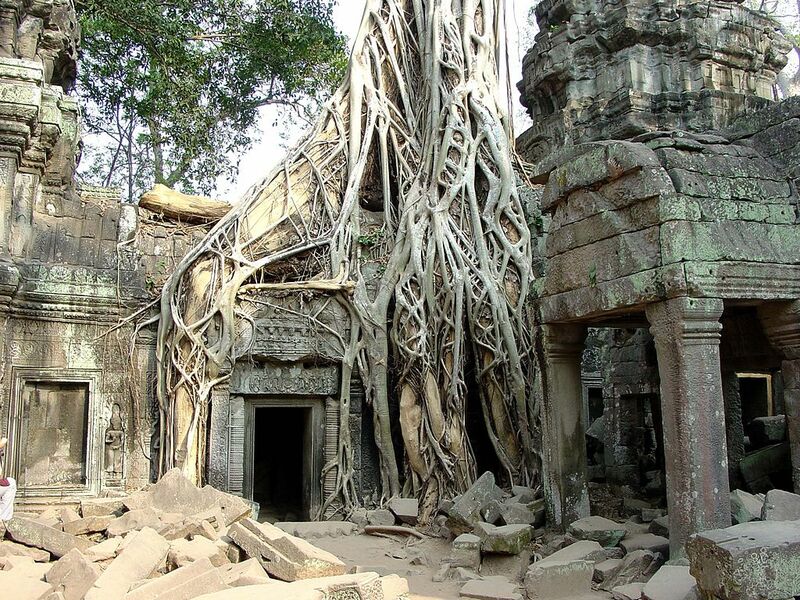 Despite their restoration efforts, the jungle has reclaimed parts of the ancient complex: Tree roots and vines are entangled with some structures, both supporting and destroying them. 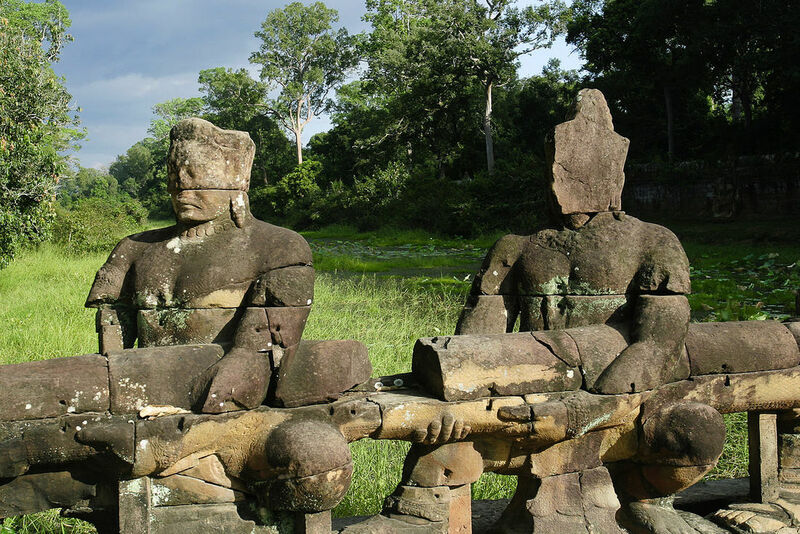 Angkor has also been subject to widely publicized looting—many of the Buddha statues no longer bear their heads. Angkor Thom - The walled town of Angkor Thom does not include Angkor Wat, but it does include Bayon. Hours could be spent at this temple trying to follow the story lines of the spectacular bas-reliefs wrapped around the temple walls or exploring the myriad claustrophobic passageways. Be ready for surprises around any corner: monks tending small shrines or paper ornaments left as signs of devotion. The image that most visitors never forget is of the 54 huge, surreal towers that rise from the temple. Each is topped with four giant faces barely smiling and staring out in the directions of the four points of the compass. The faces are identical—it's a Khmer royal ruler represented as a Buddhist deity—but because the height of the towers is staggered and each viewpoint is different, the design never feels repetitious. The temple has a different atmosphere at different times of the day, but go at dawn: The smoke from early-morning cooking fires, mixed with morning mist, is pierced by the first golden rays of the sun and framed by gigantic, smiling faces—a sight never to be forgotten. However, the temple is particularly popular with visitors, and as the inner area is quite small, it can get crowded. Angkor Wat - The main temple and the best-preserved building in the complex, Angkor Wat is also the largest—its walls have a circumference of nearly a mile/kilometer. It's believed to be the largest religious structure in the world. It's particularly memorable at sunrise, when the light reflects off the water in the moat that surrounds it. Tour buses deposit hordes at Angkor Wat just before sunrise, but it's worth braving the crowds. Preah Khan - About 1.5 miles northeast of Angkor Thom stands Preah Khan. Once a monastery and training ground for monks and spellcasters, the buildings are now in ruins. The central complex is Buddhist, the northern and western sectors are devoted to the Hindu sets of Vishnu and Shiva, and the southern sector is dedicated to ancestor worship. Some of the temples and shrines are believed to have been in use as recently as the 17th century. Ta Prohm - Another must-see is Ta Prohm. This is the jungle temple of dreams—the forest has moved in to reclaim it, and huge fig trees, tangles of vines and creepers are among (and a part of) the sanctuaries and passageways. Ta Prohm gives visitors a sense of what it must have been like for the archaeologists who first rediscovered this fantastic, lost temple. Much like every other area, Ta Prohm attracts a steady stream of visitors trailing through its corridors and lining up to be photographed in front of the tree-covered ruins. 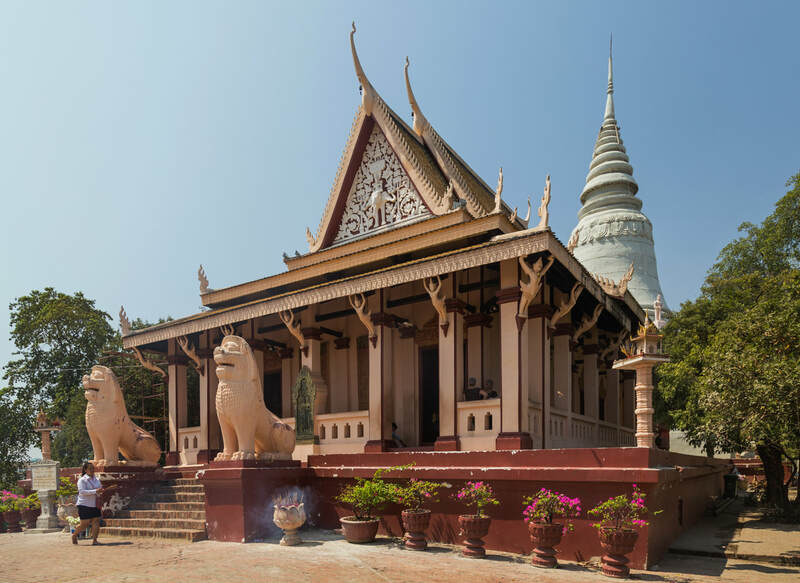 Wat Botum Park and Independence Monument - The best time to visit this pedestrian strip stretching down Sothearos Boulevard is either in the early morning or at sunset, when crowds of Cambodians go to stroll, skateboard or dance in choreographed aerobic groups. Its name comes from an adjacent temple. At one end is the Cambodia-Vietnam Friendship Memorial, a communist-style statue commemorating Vietnam's ousting of the Khmer Rouge regime in 1979. Just south of the park is the capital's crown jewel, the Independence Monument, a massive Buddhist-style structure in the middle of a busy traffic circle. 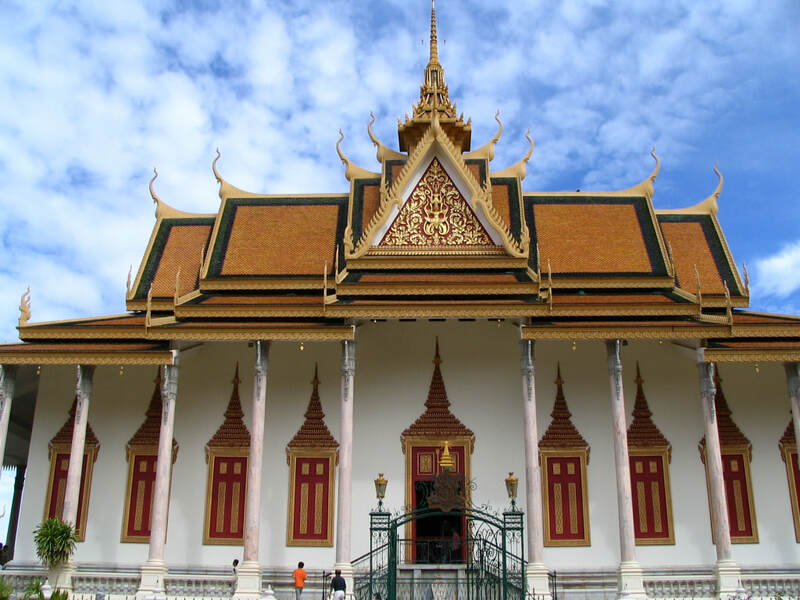 It was built in 1953 to mark Cambodia's independence from French colonial rule. At sunset its sharp, maroon features provides a remarkable figure against an orange sky. Farther east is another popular pedestrian strip with another impressive monument, a bronze statue of the late King Norodom Sihanouk, who had the monument built. Wat Phnom - Every city has an origin story and on Wat Phnom (the Hill Temple) lies Phnom Penh's. This Buddhist temple atop a small hill is a revered religious site. It also doubles as one of the city's only proper parks, with lush trees, well-kept walking paths zigzagging the hill and a renovated giant clock at its base. It is one of the only places in Phnom Penh that you have a chance of seeing monkeys. The small temple at the top is worth lingering in, but the walk up offers its own pleasures, with vendors hawking fruits, offering materials and caged birds that can be released for karmic points. Also of note, directly across the road towards the river is a tree containing one of the country's dozen or so flying fox colonies, which is a sight to see during dusk when they set out for feeding. Sarus Crane at Prek Toal bird sanctuary By shankar s.
Also known as Grand Lac, Cambodia's Tonle Sap Lake is the largest lake in Southeast Asia. It provides much of the country's food. The lake's depth reaches 45 feet during the monsoon season, but during the dry season it recedes, and rice is grown in the lake bed. You can arrange a trip, usually to see tranquil floating villages and its busy market, from either Phnom Penh or Siem Reap. The southern tip of the lake begins about 75 miles northwest of Phnom Penh. 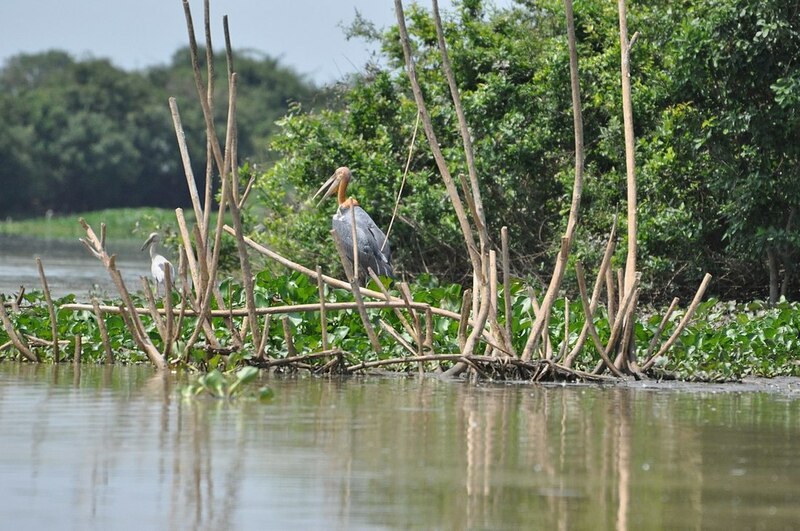 Near Tonle Sap is a bird sanctuary in the Prek Toal. Tonle Sap Lake and plays host to species including Greater and Lesser Adjuncts, Black-headed Ibis, Painted Stork, Milky Stork, Spot-billed Pelican, Grey-Headed Fish Eagle and many more species. Of the three Biosphere core areas on the Sap Lake, Prek Toal is the most popular with birdwatchers. The best time to explore is the dry season between December to May when flocks of migratory birds congregate at Prek Toal.